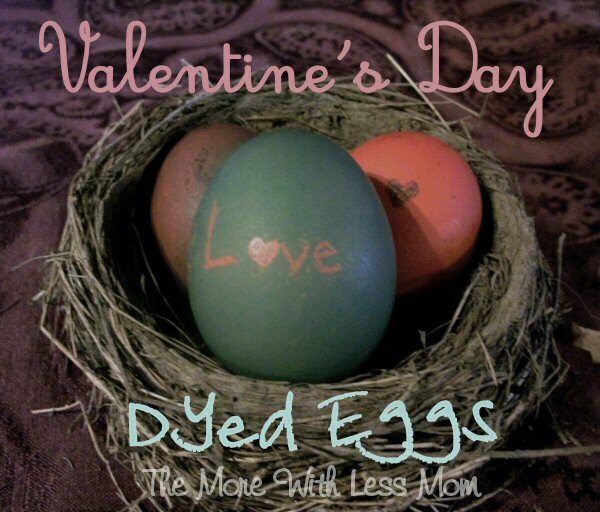 Dyeing eggs is a frugal activity that can be practiced the whole year. You should already have all the items you need. This is a craft that is easy to scale to different age groups. There are a gazillion ways to hard boil eggs. Use your preferred method, or use the Simply Recipes method. Quick version: Boil, sit 10 min covered, ice bath. I did this last time and they came out absolutely perfect. Save your cartons to store the eggs in when you’re done, but don’t put them in until they are completely dry or the carton will scratch off some of the color. 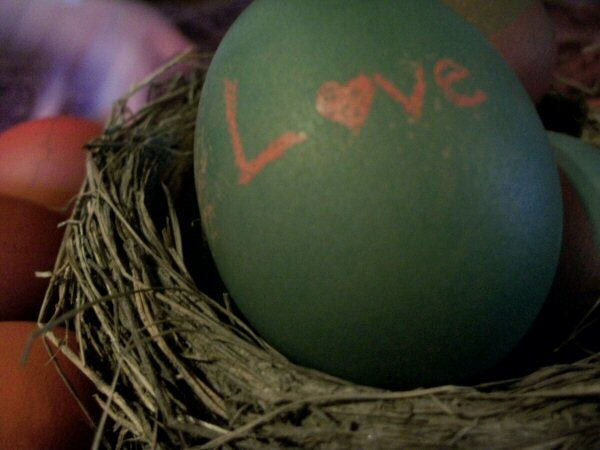 There are a bunch of things you can do to your eggs before you dye them. 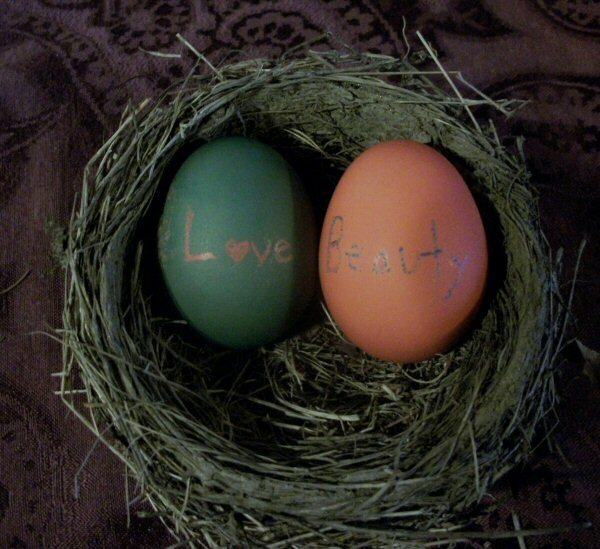 You can use the wax-resist method, color your eggs with crayons and the dye can’t penetrate the wax. We did this on a dish towel so the eggs wouldn’t roll away. The same thing goes for stickers, apparently this was not as fun this time around and we skipped them. You can wrap rubber bands tightly around your eggs to make lines. I love this look but the 4 year old nixed it. 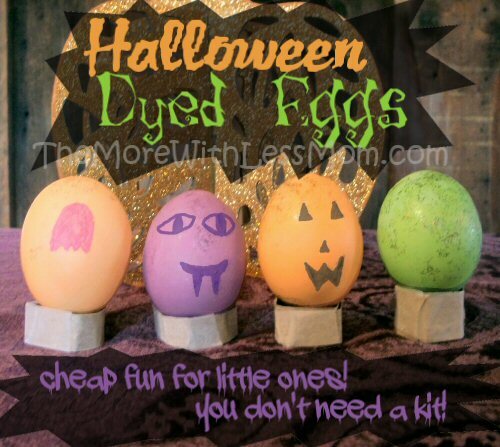 You don’t need a kit to dye eggs! You have the stuff. Take a mug, I used my soup mugs. Bowls won’t work, they aren’t deep enough (never mind the photos, that was me letting my boy help set up). Add 1 1/2 cup hot tap water. Add 1 teaspoon/a splash white vinegar. Add 20(ish) drops food coloring. We made red, pink, purple, blue, and teal. 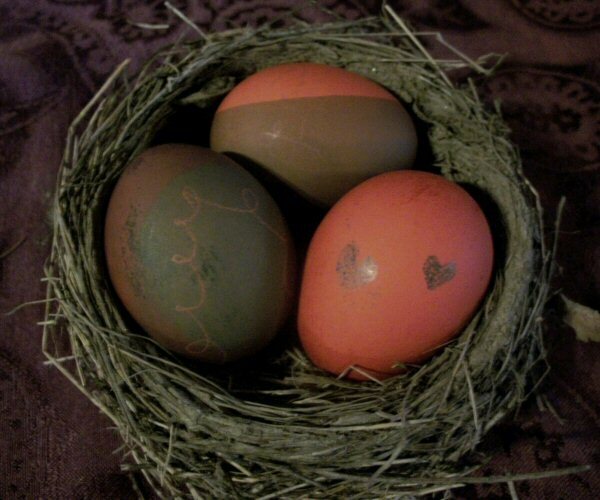 You can see that I used brown eggs, which gives you more rustic colors. I thought they were pretty but your results can be a little different than you expect. The brownish color you see was from using straight blue to dye it. If you know your color theory you know blue and orange make brown. If your eggs got a little cracked no worries, you just get a marbled pattern on the actual egg. I think it’s pretty, and it’s just food coloring, it won’t hurt you. 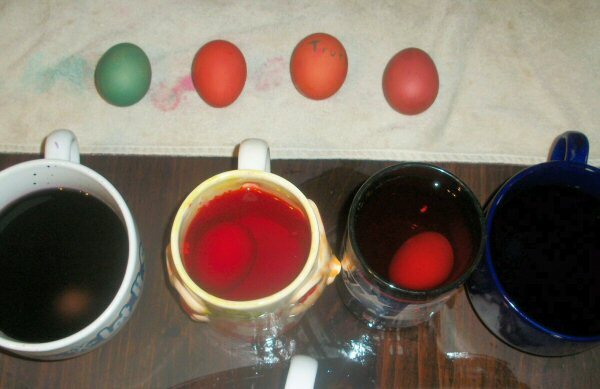 The longer you leave the egg in the deeper your color will be. You can re-dip parts of the egg to get layers of color, changing position and/or colors. A whisk is helpful for holding an egg partially submerged. This is how I got the almost ombre stripes. Or cover parts with tape and re-dye. I put a kitchen towel down to dry them on, you can gently roll them to encourage them to dry. 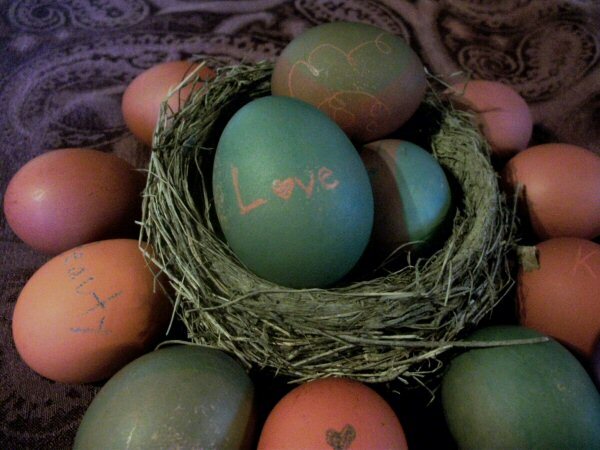 There are many ways to decorate your dyed eggs. You can use markers to draw faces and designs on them, or crayons. You can add glitter. We painted on glitter glue, but if you glitter them odds are good you will be eating glitter. 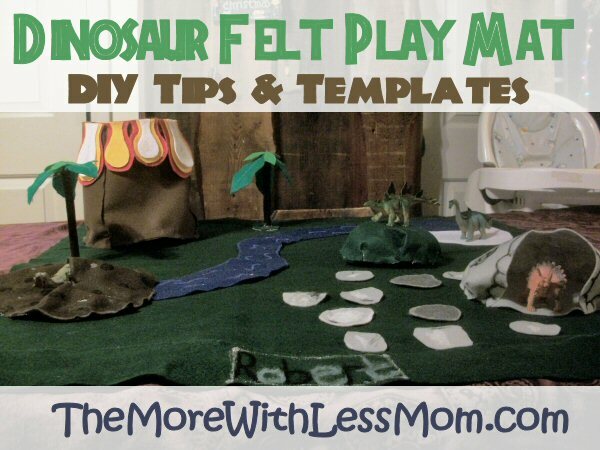 You can glue tissue paper pieces or hole punches on. You can use pipe cleaners to make arms, legs, wings, etc. 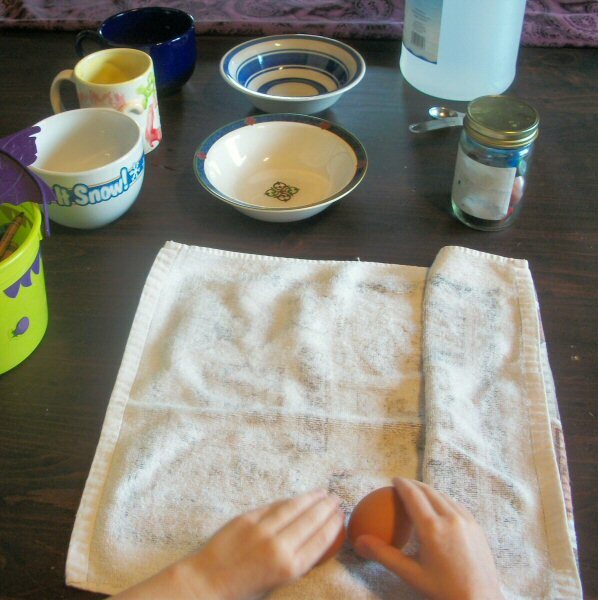 Make holders for your eggs with little strips of cardboard taped into a circle. 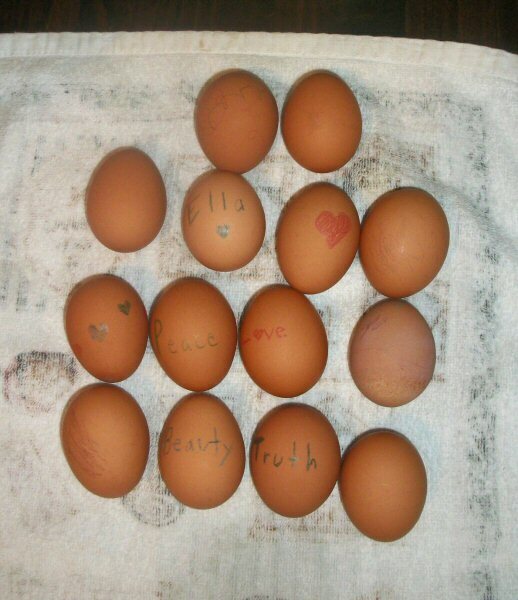 Store your eggs in the fridge and eat them within 5 days.